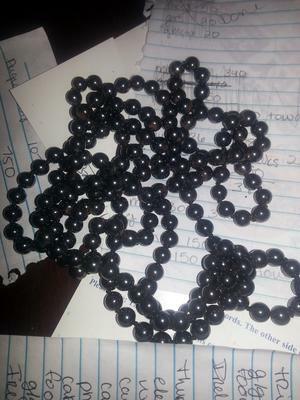 Are these real black pearls? 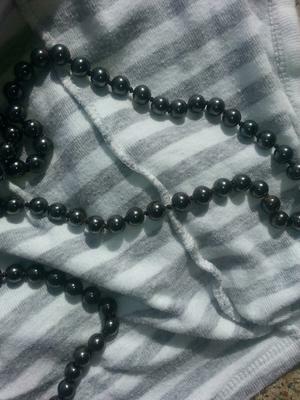 I inherited these pearls from a grandmother of my fathers. My grandmother told me that she wasn't sure but she thought they could be real because they were bought for her by her husband, and they had a lot of money, even for back then. Example they left their two grandkids 250k each in their inheritance. I've taken pictures please let me know what you think. They are heavy and are cold when you pick them up. I did the "teeth test" or what not, and they do have a gritty feel to them. The problem is I don't know if the chips in them and what they look like means they aren't real. 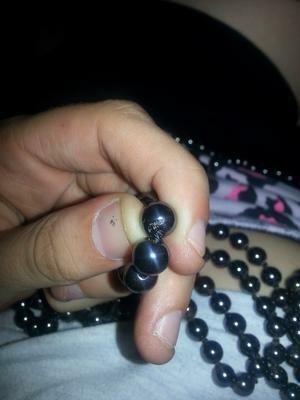 They have no clasp and are knotted in between each "pearl".